Doesn’t it look dreamy? 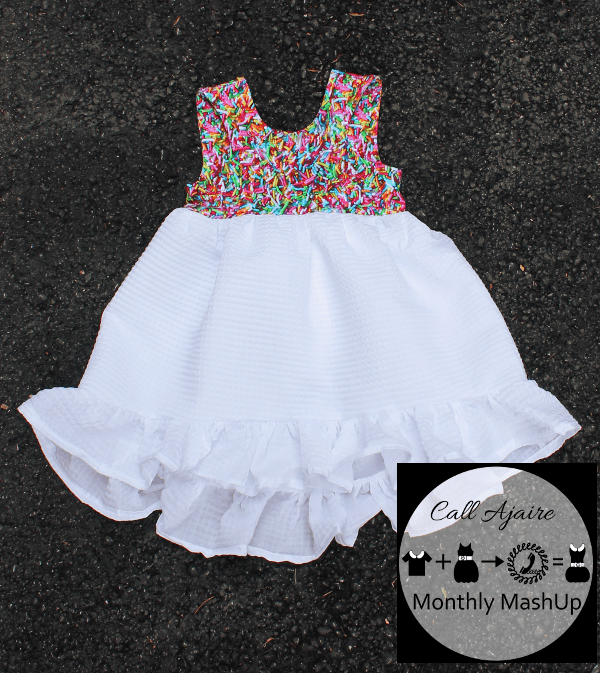 See Kate Sew‘s Daydream Ruffle Dress skirt mashed with the bodice of the Lil Luxe Collection‘s (*affiliate link) Alley Cat Romper is a perfect combination. The knit bodice is snug and comfortable, fully lined, and has that dramatic back neckline. 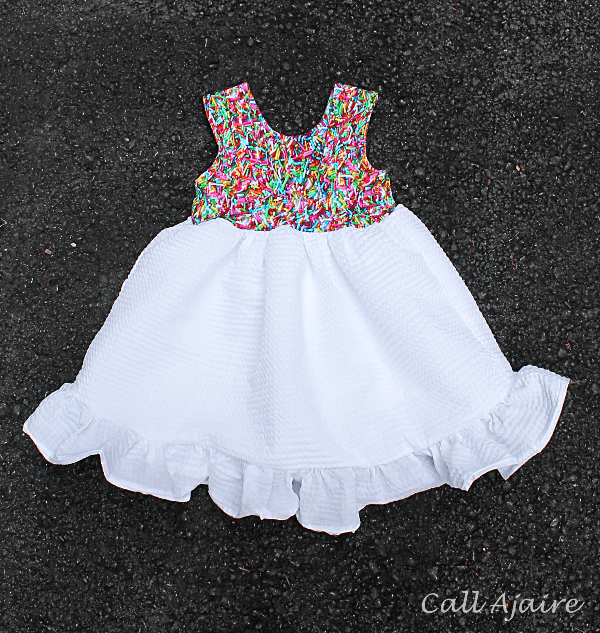 The ruffled skirt has a high low hemline which is accented with an additional ruffle. There is just enough poofiness to make it look like a cloud. 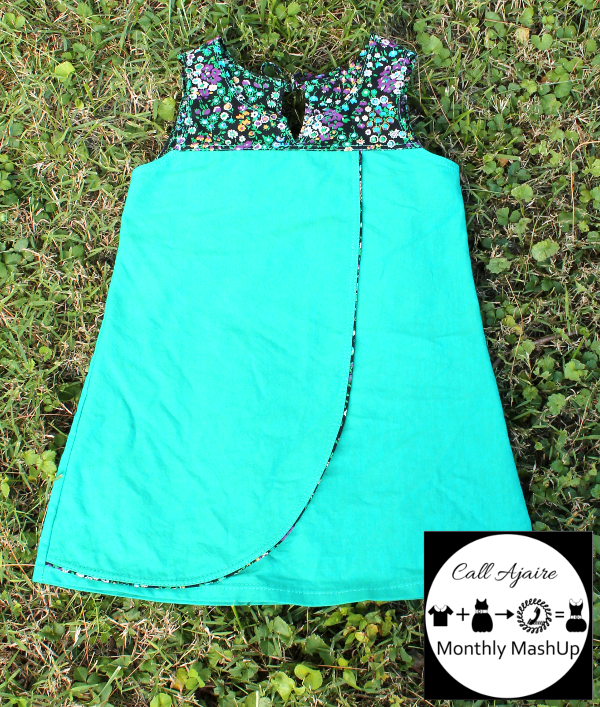 The best part of this MashUp is that there are NO alterations that need to be made to the pattern pieces. All you need is the two patterns. The specific pieces you’ll need from each of the patterns is in the graphic above. If you already have the patterns, then find a chance to make a muslin of both so you’ll know the correct size to use. I used size 3t for both of the patterns and the fit is perfect so that’s the size I used for my MMUp. 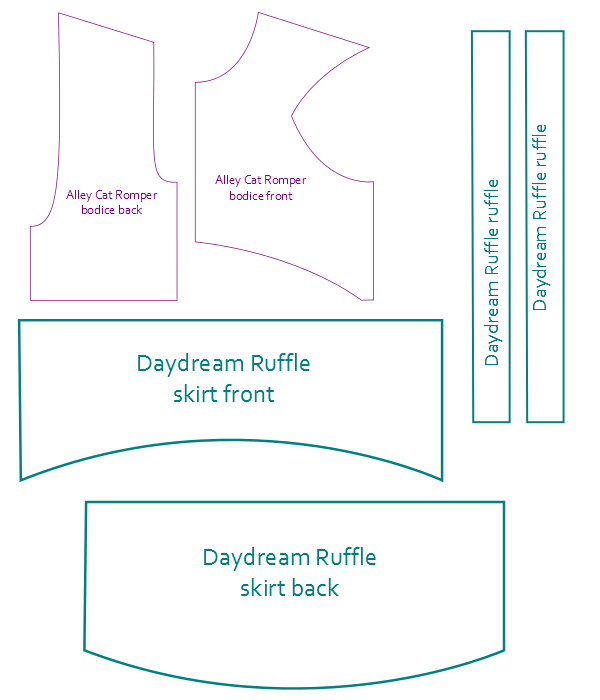 If you haven’t purchased them yet you can still get the Alley Cat Romper at a 20% discount using the code mashup here (*affiliate link) and the DayDream Ruffle Dress here. And of course the giveaway is open until the 17th so there’s still time to enter to win your copies. Be sure to follow the Monthly MashUp Pinterest board if you’d like some more inspiration for garments to mash. That sprinkles (or jimmies, depending on where you are) pattern might just be the best thing I have ever seen. The fabric is too much! I love it! haha i love the sprinkles it makes the whole thing even more whimsical!